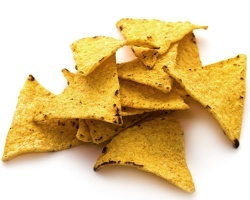 How can I reuse or recycle … non-crisp crisps or non-cracking crackers? | How can I recycle this? How can I reuse or recycle … non-crisp crisps or non-cracking crackers? John and I were digging through the cupboards for something to accompany our cheese-and-bread lunch yesterday and we can across half a soggy pack of cream crackers and a long-opened pack of nacho chips. They had lost their crack, their crisp and their snap. They weren’t out of date, just had been left unsealed and absorbed the steam from our cooking in the kitchen. They tasted fine, just were disconcertingly chewy. Has anyone got recipe suggestions that would cover up the lack of crunch? I use them as a topping to tuna and pasta in white sauce ( and chilli). Bake in the oven and you get a nice crunchy topping. Basically, layer a bunch of tex mex ingredients in a pan much like a lasagna (beans, cheese, fresh cut tomatoes, jalapeños, etc). As one of the layers, throw in old chips. One you the ones in the middle become soft and perhaps help the dish stick together more along with the cheese. Make sure to throw some broken up chips on top for a crunchy and tasty surface. It’s good. Trust me. Great idea! Put them in the oven, fire it up, and spew more C02 into the atmosphere. I think the birds and squirels can make good use of stale stuff – and they don’t need electricity or gas to do it. Sometimes recycling doesn’t make sense if you think it all the way through! On the other hand, if you’re already using the oven to cook other food at the same time, it will need less energy to get/stay warm if you add more stuff like these crackers. Or you could put them in the cooling oven after you’ve taken something out – if you’ve been cooking on a high heat, it’ll take a while to cool down and that might be more than enough time to crisps thses up again. To add onto the re-baking idea – you can make a solar powered oven quite easily. Box + foil (inside) + black paint / paper (outside) + sun + time = oven. I used to bake cakes doing this in the summer. Put soft (but not nasty tasting) crumbs and other ingredients into a blender and make your own sandwich spread. Grind it up and use it like flour. Crumble it and add herbs – homemade shake and bake. Most of the crackers are high in salt or oil, so using it as compost wouldn’t be a good idea.